Police officers have arrested a fugitive after seeing through his elaborate disguise as an elderly man. They surrounded a house in South Yarmouth, Massachusetts, and ordered Shaun "Shizz" Miller out. 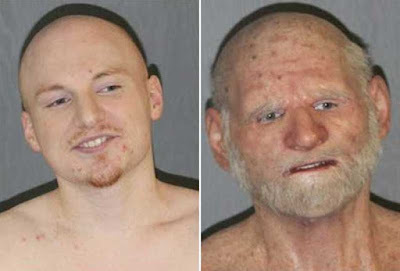 He walked outside in disguise and when they realised the "elderly man" was actually the 31-year-old they were looking for, they arrested him. He had been on the run since being charged with heroin trafficking offences in April. When officers searched the house in South Yarmouth, they found two loaded weapons hidden in a laundry basket, and nearly $30,000 (£23,000) in cash. The Bureau of Alcohol, Tobacco and Firearms tweeted that the charges against Mr Miller were part of a larger complaint into the Nauti street gang, and that 12 other people had also been charged. There's a job waiting for that guy in Hollywood when he gets out. I'll give him marks for trying at least.